How Does Seattle’s Mandatory Housing Affordability Affect the Housing Market? As we get into 2018, one goal on many Seattleites’ list is to see more housing affordability throughout the city. Lots of people are moving here every day with a limited amount of new and affordable housing options becoming available. Because of this, home prices continue to rise, taking the land value up right along with it. One piece of legislation may have a part in the predicted slowing down of the market in 2018: Seattle’s new Mandatory Housing Affordability policy by the Housing Affordability and Livability Agenda. As the time to enact this new policy crawls closer (summer 2018), how will this strategy affect Seattle’s housing market? What is Mandatory Housing Affordability? The Mandatory Housing Affordability (MHA) is a policy which “ensures that new commercial and multifamily residential development contributes to affordable housing. MHA will provide at least 6,000 new rent-restricted, income-restricted homes for low-income people.” In other words, MHA creates more housing choices for Seattle’s beloved working-class families, ensuring they’re able to remain in the city. In 2017, MHA was enacted in six various neighborhoods across Seattle, adding development capacity near such community assets as parks, public transit, and jobs. The goal is to implement “less intensive changes in areas with higher risk of displacement, environmentally sensitive areas, and areas with fewer community assets” while focusing on neighborhoods without those major concerns. Mandatory Housing Affordability is a part of the Housing Affordability and Livability Agenda (HALA) in Seattle. It’s designed to create more homes, and more affordable housing, in a city that severely needs it. A framework legislation was introduced in 2014 and the implementation includes zoning changes, affordability requirements, and design standards. By summer 2018, it is expected that the City Council will adopt citywide MHA, according to the timeline. Who is Affected By MHA? Seattle’s Mandatory Housing Affordability not only affects a large number of home buyers looking to move to the region, but also those who currently live here. MHA focuses primarily on neighborhoods with low risk of displacement and high access to opportunity (i.e. public transit, jobs, parks, and other community resources). This includes regions such as Admiral, Ballard, Eastlake, Fremont, Green Lake, Greenwood-Phinney Ridge, Roosevelt, Wallingford, and more. One major concern regarding MHA is its potential to displace those currently residing in many of Seattle’s neighborhoods. Because of this, MHA takes into consideration the level of displacement risk for each community. Neighborhoods with a high risk of displacement will experience moderated rezones to “ensure that market rate development contributes for affordable housing […] while minimizing the scale of change to these communities” (source). Those who have already seen MHA’s effects in 2017 are U District, Downtown, South Lake Union, Chinatown/International District, Uptown, and portions of the Central Area. With these recent rezones, new development projects must now contribute to affordable housing. When considering the full effect of these rezones on a market as intense as Seattle, the situation must be examined from multiple angles. Ideally, the rezones are designed to assist with common challenges Seattle residents and transplants alike are facing. Not only does MHA provide rezones for higher density in certain areas, but it also places requirements on developers to either build affordable housing or pay toward a fund to support affordable housing elsewhere. The idea, as part of the Housing Affordability and Livability Agenda (HALA), is partially designed to encourage more racial diversity in this neighborhood and others like it, if successful. 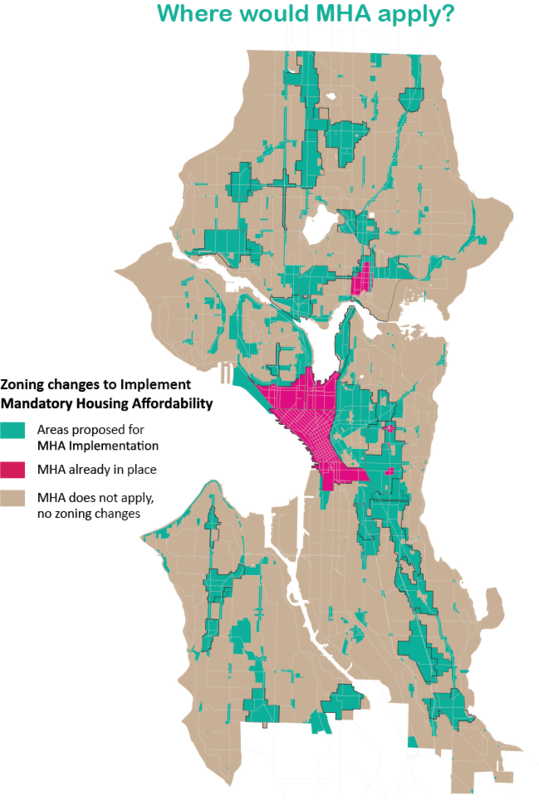 Additionally, improving the infrastructure within Seattle’s neighborhoods, in general, entails adding more ‘gentle density.’ In other words, it means adding more townhomes, duplexes, and triplexes to allow for more affordable housing on current property lines. MHA’s rezones creates Urban Villages whereby the housing is created around community resources such as parks, work, and public transit. Because housing is close to these resources, residents are encouraged to use the transit options now at their disposal or, at the very least, shorten the commute and keep more cars off the overcrowded highways. The City Council will review the legislation as a committee and conduct a public engagement process before voting. These events will include open houses, lunch-and-learn events, and public hearings. To see which events are coming up in your area, review the calendar here. Seattle’s Mandatory Housing Affordability will provide opportunities for current Seattle residents who own property within the rezoned areas. To find out how you may be affected, or to take advantage of the benefits of the rezone, talk to one of our team members for a no-obligation consultation and get a free offer on your home.